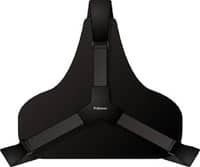 Fellowes Professional Series Back Support fully adjustable back support features a 3 section lumbar support which expands and contracts to natural body curvature. This fully adjustable back support features a 3 section lumbar support which expands and contracts to natural body curvature. Innovative Tri-Tachment ensures stability eliminating constant readjustment. Easy setup: Place support on chair, position your back and just clip the straps! Accredited by the FIRA International, an Indpendant Ergonomic Accreditor.